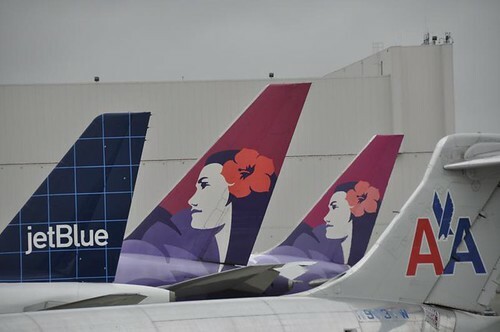 American Airlines and JetBlue announced a new reciprocal frequent flyer agreement that will allow each airline’s frequent flyer members to earn miles on select routes when traveling on the other carrier’s flights. American Airlines and JetBlue Airways announced today the launch of a reciprocal frequent flyer agreement, effective Nov. 18, which allows members of the American Airlines AAdvantage® program and JetBlue’s TrueBlue® customer loyalty program to earn AAdvantage miles or TrueBlue points, respectively, in select markets. In addition, the commercial agreement announced in March 2010 has been expanded to include one new American Airlines international market and nine new JetBlue domestic markets. Customers will now be able to easily connect on flights to a total of 15 of American’s international destinations departing from John F. Kennedy International Airport (JFK) and Boston Logan Airport (BOS), including Barcelona, Spain (BCN); Rio de Janeiro, Brazil (GIG); and Tokyo, Japan; and 26 JetBlue domestic markets, including Portland, Maine; Rochester, N.Y.; or Richmond, Va.
Below is the list of markets where customers can earn AAdvantage miles or TrueBlue points and in which cooperative, interline service is available, including seamless check-in and baggage drop services for customers connecting between American and JetBlue. I was looking at this chart and started thinking that if you took the routes and markets served by this agreement and spun them off into a separate airline, you’d have an airline a lot like Pan Am in the final years. Which of course means nothing, just an observation.